Elizabeth Lwanda Rutsate holds a Doctor of Philosophy- Law degree; the Masters degree in Women’s Law (MWL), the Bachelor of Laws (LLB) and Bachelor of Law (Honours) (BL) degrees from the University of Zimbabwe. She has worked as a magistrate and legal counsel in both public and private practice and has successfully done several consultancies on women and the law. Her research and teaching interests revolve around women, the environment, access to resources and the law as well as sustainable development. 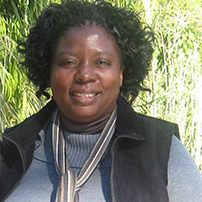 Between 2010 and 2013 she was part of the Zimbabwean research team on a regional study covering Kenya, Malawi, South Africa and Zimbabwe on “Human Rights, Gender and Water Governance” funded by the Norwegian Research Council and coordinated by the Institute of Women’s Law at the University of Oslo and SEARCWL. Elizabeth is a Senior Lecturer in the Faculty of Law, University of Zimbabwe.